The Historic Centre of Cesky Krumlov is best known for the fine architecture and art of the old town and Krumlov Castle. Construction of the town and castle began in the late 13th century at a ford in the Vltava River, which was important in trade routes in Bohemia. 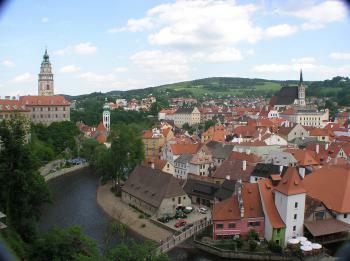 The town became the seat of the Duchy of Krumlov. Between 1938 and 1945 it was annexed by Nazi Germany as part of the so-called Sudetenland. The town's German-speaking population was expelled after liberation by the American Army during World War II and it was restored to Czechoslovakia. During my quick dash into South Czechia last week (3 WHS in 2 days) I stayed overnight in Cesky Krumlov. It’s perfect for that, as everyone seems to rent out rooms and there are restaurants to every taste. I arrived around 1 pm on Friday afternoon and left again at 10 am on Saturday morning. By that time I had seen most of the small historic center. As it was raining on Friday, I decided to go to the town’s museums first. The Egon Schiele Art Centrum is an exhibition centre dedicated to modern art, named after the expressionist Egon Schiele who lived in Cesky Krumlov at the beginning of the 20th century. I knew of Schiele from my Art History study at the Open University, where his distorted portraits adorn the "Expressionism" handbook (a course that I failed twice, and gave up on). Schiele was eventually chased out of Cesky Krumlov because he would let young girls pose naked for him. There is not much of his work on display here (it has very high value), most of it is in the Leopold Museum in Vienna. Nevertheless, it is a beautiful art exhibition centre. I enjoyed the current exhibition of the works of the Czech Pavel Brazda especially. Due to the still pouring rain I hurried on to the castle, where I bought a ticket for the first available guided tour. Unfortunately I did not really pay attention: there are several kinds of tickets for sale, and I really wanted to go to the castle theater which apparently is very beautiful. However, together with around 40 other tourists, I ended up in the palace quarters. Rarely interesting, and no exception here - only the many stuffed bears used as carpets are remarkable. The castle owners have always kept bears in the castle moat. Two supposedly still are there, but they were not "on show" when I visited probably because of the cold. The most beautiful hall of the tour lies at the end: the Masquerade Hall, with painted masked party guests on all walls. No pictures are allowed inside the castle unfortunately - the reason given here is that the tours would take too long if everyone had to snap his or her perfect shot! The next morning the sun was shining at last, and I toured the town with my camera. From the various bridges there are beautiful views of the castle. The castle is so overwhelming that it looks too big for the small town centre. I did a full loop in an hour "uphill", through all the courtyards of the castle, across the white-blue mantel bridge and past the gardens. You eventually end up at a bridge at the other end of the town. This is a nice walk in the early morning, though I certainly was not the only one to enjoy it. Cesky Krumlov is really flooded by mainly Asian tourists, in the middle of summer it has to be terrible. Its medieval street plan does not accommodate such high numbers of people. Although it has kept its atmosphere well and it is a friendly place in general with some nice small cafees, it could do without tourist traps such as the Wax Museum, the Torture Museum and the Shanghai Restaurant. I know everyone uses the term 'fairy tale' to describe Cesky Krumlov - but it really is apt! It's such a beautiful place and looking down from the viewpoints and walking through the streets is so charming. I really enjoyed my visit here. I only went as a day trip (from nearby Ceske Budejovice, which is a good alternative for accommodation). A day trip was easily enough time to see everything, including the castle. But I do suspect it would be quite nice to spend the night in Cesky Krumlov and explore a bit more when the tour groups all leave. I also saw people kayaking on the river and that would be a lovely way to spend an afternoon, if you had a bit more time. Other than Prague, this would have to be the most-visited of the World Heritage Sites in the Czech Republic - but for good reason. I would definitely recommend visiting Cesky Krumlov and spending at least the day, if not overnight as well. A well-deserved WHS. Walking through its streets is like being in a fairy tale. Each of its corners is magical and charming. It is worth the 3-hours bus ride from Prague. As the historic center is small, you can visit everything in one day. I think it is one of the essentials of the Czech Republic. We visited South Bohemia in October 2013, and spent two days in the charming town of Ceský Krumlov. I must admit that I have a preference for medieval towns but certainly every visitor will be captivated by this lovely place. Ceský Krumlov is enclosed by a tight bend of the Vltava river giving the old town the character of an island. The townscape is dominated by the castle that towers above the old town. There are wonderful views from the castle tower or the Cloak Bridge or in the reverse direction from the old town up to the castle. The photo shows the multi-storey Cloak Bridge, which connects the castle with the park. The entire castle complex is open to the public from early morning until late in the evening. The walk through the five courtyards and the park was most atmospheric in the early morning, shortly after sunrise when the fog above the town lifted. The castle was built in several sections from the 14th to the 19th century, the buildings of the main palace are in Renaissance and Baroque style. They are located around the third and fourth courtyard and decorated with well preserved wall paintings. The interior of the palace can be visited on two guided tours, each takes about an hour. However, we skipped this, but I can recommend a tour to the Baroque theatre. The stage and the auditorium are preserved in their original state and have been recently renovated. We also went under the stage to see the machinery for moving the stage settings. And the equipment for "sound effects", such as wind or rain, was demonstrated. We also visited the Eggenberg brewery, which is also located in the core zone. The tour (every day at 11 a.m.) includes the historic brewery facilities and the more modern filling plant, and of course also a beer tasting. Not bad, the beer tastes well, but parts of the buildings were a bit run down. The guide told us that they are in negotiation with foreign investors, so maybe better times will come again. Ceský Krumlov has enough to offer to entertain a visitor for two days or even more if you also want to explore the surrounding countryside. This is a film I made about Cesky Krumlov in the Czech Republic (Swedish voice-over with English subtitles). I love Cesky Krumlov and not only because I was born in this beautiful gem of a town. The enchanting cobbled streets and magnificent castle invoke feelings like one was in a fairly tale, but it is the history of the town that brings it all together. Truth to be told, I trully started appreciating the beauty of the town, once I moved to England. 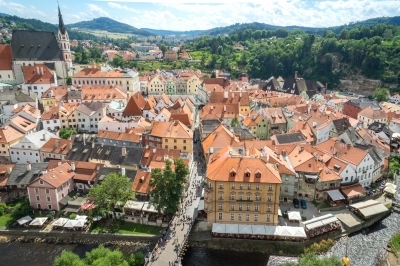 Having lived ten years abroad and travelling whenever possible, my point of reference became much broader and it is only now I see Cesky Krumlov for what it really is. If visiting in the summer, try to get tickets for a play in the 'rotating open air theatre' in the castle gardens. Performances are in Czech, but most stories are well known and you will be able to follow even without understanding the words. I visited Cesky Krumlov recently as a member of a 16 strong walking party from New Zealand which spent three weeks in Central Europe. I think that all of us were agreed that our three days in this magical place were the best three days of our trip. We stayed in the Old Inn in Svornosti Square and the scene was set by the staff who wore national costume. Just walking the streets was a joy but the highlight was our tour of the Castle and particularly the amazing Rococo theatre. The guided tour gave us a real insight into what it must have been like both to perform and to watch a performance in this incredible historical venue. It's hard to believe that this wonderful town was so neglected at the end of the communist era and has been restored to its former glory in such a short time. I'd certainly recommend any visitor should stay at least as long as we did. I only wish we had been able to stay longer! I have been once in Ceský Krumlov and it was, apart from Prague, the Czech town I most liked. It was constructed in the 13th century on a double meander of the river Vltava and was controlled by the family Rosenberg from 1302 to 1611. After the czech defeat (1620) at the White Mountain it passed to the family Eggenberg and then Schwarzenberg, that left it when the sovietic army came in 1945. The monument that dominates the town is, on a hill, the huge castle, in Gothic, High Gothic, Renaissance and Baroque styles, but projected especially by Baldassarre Maggi, with a high decorated round tower and two stunning courts with frescos. Very nice for its frescos by Josef Lederer is the room of the Masks, the Rococo chapel and the Rococo theatre that contains the original scene machines. Beautiful especially if you see it from the bottom is the bridge, with four storeys of arcades, that goes over a small valley and brings to the terraced gardens. There you can find the summer palace Bellaire, the winter riding school and the stables, projected by Andrea Altomonte. Under the castle there is the quarter Latrán, constructed around a street that begins at the Renaissance gate of Budìjovice, projected by Domenico Benedetto Cometa, and finishes at the bridge that brings in the centre. On this road you can find a lot of beautiful decorated buildings: the most important are the church of St. Justus, with a nice tower, the Renaissance arsenal (projected by Cometa), the town hall of the quarter with graffiti, a convent with the church of Corpus Christi, a Gothic cloister, a vast court, sculptures and a bulwark, remain of the town walls. Incredibly pretty are, on the opposite bank of the river, where is the centre, the decorated fronts of the Renaissance houses, that contain wooden ceilings, and the streets, with a regular layout, that bring to the main Square of the Concord. There are the Virgin column, made by Mätthaus Wenzel Jäckel, and the Renaissance town hall (crated by combining several houses), decorated with columns and coats of arms. Very nice is the small island on the Vltava and the nearby brewery, on the Wide Street, and the school. On the Upper Street there is the Gothic main church of St. Vitus, with nice vaults, frescos and altars, the chantry, the prelacy, with Rococo stairs on the court, the jesuitic college, projected by Baldassarre Maggi, and seminary. This town is one of the most beautiful places I have ever seen, because of the quality of its architecture and of the decorations. It's absolutely worth to be vistited (if you go there you must leave the car out of the centre, closed to the traffic). It justifies the inscription and it's the second nicest town in Czech Republic with the second biggest castle (that you can visit only with a guided tour). Absolutely marvelous and magnificent. Just be sure you are there early in the morning or you will "fight" with other tourists. Don't miss the main attractions and Gardens and local Eggenberg brewery! Great thing is to rent a raft above the town and raft through the town to Zlata Koruna. Cesky Krumlov, or Krumau in German, is a gem of a village, but not really a secret anymore. Lots of people have discovered it, and it would be advisable to visit outside of high season. The essence of the town is medieval, but there are Renaissance and Baroque monuments as well, and the Vltava River meandering through town gives it an even nicer atmosphere. Because it used to be way off the beaten track, it usually escaped marauding armies and was thus able to preserve its historic townscape. It is probably too far from either Prague or Vienna for a daytrip (but certainly doable if you want to), but there's enough to see there for two or three days anyway. Cesky Krumlov is a magical place. So small, so beautiful. Almost impossible to believe that it was damaged by floods a few years ago. Not to be missed: The castle, the main square, just roam around the streets. Cesky Krumolov is so small that can be visited for only one day, but is so beautiful that you might stay there for months. I have spent a lot of time in the Czech Republic and travelled pretty extensively around it, and I don't think I saw anywhere as beautiful as Cesky Krumlov. The centre is a maze of alleys and streets moving up hill and down to the river banks. It is perhaps a cliché but the town is like the setting for a fairy tale. There are quite a few tourists going around in groups during the day, but it is manageable. I would recommend staying at least a night and relaxing with a few glasses of beer whilst the day trippers rush by. Then head out for some exploring when it has quietened down a little, and then finding another pub. We rented canoes and paddled through the centre and carried on a few hours down stream. This was a great way to view the centre of the town, especially the brightly coloured castle. Cesky Krumlov is a real gem and a highlight of central Europe. It is well worth of a trip down from Prague for a couple of days to recover from the crowds. Cesky Krumlov is like something out of a fairy tale. You can almost imagine knights riding down the streets and princesses waiting to be rescued from the castle! I recently spent three days there and enjoyed every minute. It is the kind of place that everyone hopes to find in central Europe. The whole place is in excellent condition and rates as one of the best WHSs that I have ever visited. A wonderful place to visit. The city hall beside the sguare is good but the internet service not easy for tourist,for it is not support the English. Is the statue in center of square is a memorial for plague( a black death disease)? I like to have a trip again if it is possible. Hitler was here: During his second visit to the newly annexed Sudetenland Hitler spoke in front of the Rathaus of Krumau (now "Cesky Krumlov") on Oct 20 1938. Krumau became a part of Austria. Built in the 13th century: Although the castle contains a famed Baroque theatre the site's OUV derives primarily from its 13C castle and the mediaeval settlements which grew up below and opposite it. Twin Towns: Krumlov and Latran - where the castle is located- used to constitute two distinct towns separated by the river. 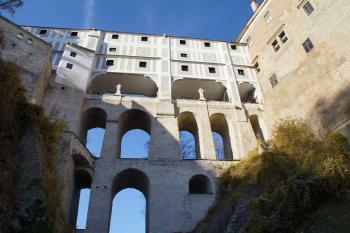 Europa Nostra Award: "The conservation of the Southern façade of Horní Hrad (Upper Castle) of the Cesky Krumlov State Castle, Czech Republic" (Prize - 2008 for Conservation).